British Airways had a lot to celebrate this week at Washington Dulles. The route saw the inaugural flight of its A380 into the airport (to read a review of that flight, click here), and opened a new airside Galleries Lounge replacing one which had shut several months previously. The Washington lounge is the latest in a line of BA lounges to be relaunched, following Newark, Cape Town, Edinburgh and Belfast City. According to Kate Thornton, BA’s head of products and services for BA, this lounge will be followed by “new ones in Amsterdam later this year and another in Dubai early in the new year”. Airside, after security by the B gates at Washington Dulles, close to where the BA flights to London depart from. Take the train to Concourse B and go up to the Concourse Level, and the lounge is straight ahead on the left. 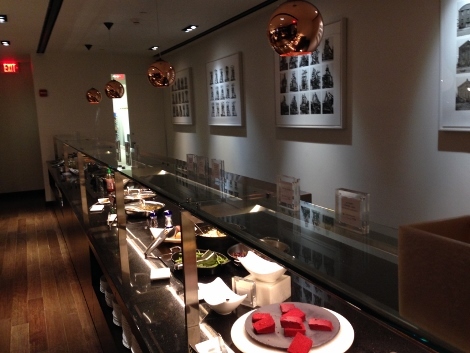 The lounge is open from 1430 until 2230 with Club World pre-flight dining from 1600 onwards. Strangely, First passengers can dine in the Concorde Room earlier, from 1430 onwards. BA’s flights leave in the evening, and so the lounge (in theory) would be empty during the day. Instead, it’s possible to use the lounge earlier. Presumably, it then closes and the full food and beverage offering, including the pre-flight dining, is rolled out. Click here for full details. Large (at 930 sqm) and elegant, with thoughtful design and lots of natural light coming in from the floor-to-ceiling windows on one side, and views down to the airport retail level below on the other. I took some pictures while walking around, but they don’t do it justice, so when/if BA makes official photos available, they will be inserted into this review. The lounge can accommodate 200 guests. Designed by interiors group Graven (also responsible for the new Glasgow BA lounge, I believe), other companies involved in the project are TPG Architecture, Hill International and Patner Construction, who have sourced “local joinery, timber veneers and leathers from North America in a design scheme that combines the very best in American, British and European design”. 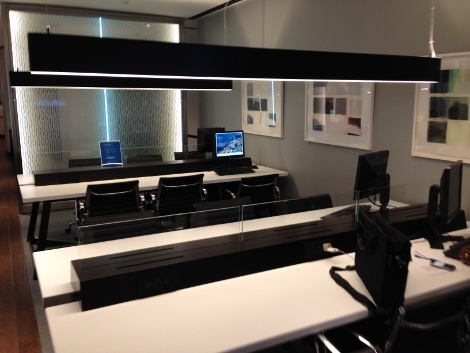 On arrival, the design is immediately, with the BA speedmarque placed against a glistening Giles Miller surface finish to the wall behind reception, similar to the one in the BA lounge in Capetown (see news, December 2013). There’s a space for storing your larger luggage items to one side of the lift and then you walk into the lounge. This dining room has “rosewood and leather encased dining areas“. I didn’t eat in the Concrode Dining Room, although a few were doing so. Note that you can only go into the Concorde Dining if you are flying First or are a guest of someone flying First, so don’t try waving your Gold or Emerald card around. It won’t help. As for the rest of the lounge, it’s a combined business and First experience so there are no other restrictions for gold or silver card holders. At first the lounge seems a little odd, long and thin. A long window on the left looks down to the boutiques you’ve just walked past to access the lounge, while on the right there’s a sliding door which opens into a private room. The furnishings are from Tom Dixon and there are hand-crafted furniture pieces from New York-based Bright, using Osborne & Little fabrics. 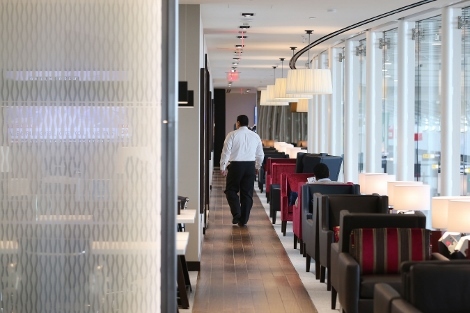 Keep walking and you get to the entrance to the Club World dining area which also doubles as a snack and drinks area for those not wanting a full meal, or who arrive before the pre-flight dining is open. The Club World pre-flight dining area has large windows, a good collection of food and several different seating areas. On offer is “a full three-course menu with appetising starters, hot entrée and tempting deserts complemented by attentive service from our dedicated lounge team”. There’s a deli area for light options “including a selection of freshly made artisan breads, locally sourced cheeses, heart-warming soups and tasty treats such as our lemon and dark chocolate cookies and a range of Twinings tea, freshly ground Fairtrade coffee”. I wasn’t hungry, and so in best jet lag style had a large plate of assorted salads, then a main course of stir fried rice, followed by some sweet treats, then went to the bar and munched through some wasabi peas and a couple of bowls of M&Ms. Others had options made for them by the chef behind the counter. Drinks were brought to us either from the wine stand in the lounge or from the bar, depending on what was ordered. Plates were cleared quickly, making it easy to deny to yourself just how much you had eaten. I didn’t see the showers, but BA describes the the shower suites as “equipped with the very latest in Raindance technology from Hansgrohe with a jet that feels like a lush shower of rain – switch between RainAir, Whirl and Rainflow to suit your mood complemented by Elemis – the acclaimed British Spa Brand ‘Quiet Mind’ products to soothe and calm your senses”. Further along the corridor, there’s a work area with internet-linked PCs and printer, with plenty of plugs. There are also power points close to most of the seats in the lounge. Once connected to the free wifi in the lounge, you can print wirelessly from your device to the printer in the work area. Further along still, there is another drinks area, a second newspaper and magazine stand, and then a sitting area and the main bar. 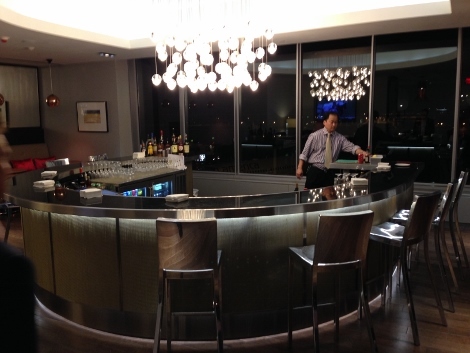 The bar is wrapped in a herringbone metallic weave and has iconic Hudson barstools by Phillipe Starck. The lights are “suspended globes of light which interact with the bubbles and imperfections of the glass to produce a glow reminiscent of small candles floating on spheres of water, designed and fabricated in Vancouver, Canada by Bocci”. We didn’t have long enough here to get really comfortable in the bar, and it needs plenty of people since it’s a considerable space and can seem a little empty without a crowd. It’s good to have a proper bar area, however. It’s something that BA lounges have lacked in the past, but when you have time to kill and fancy a drink it’s a nice change having a bar to sit at, rather than just sitting in an armchair drinking or continuing to work (although, of course, you have those options here as well). As you’d expect, the flights are called from the lounge, and it’s a short walk to the gate. This is a great addition to the Galleries lounge network, and the staff throughout were attentive and proud of the new facility. 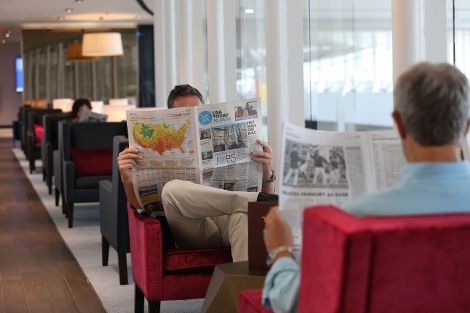 The new pre-flight dining means you can maximise the time asleep on board for the short flight back to the UK overnight, and judging by how everyone went to sleep the moment we took off that evening, the new lounge will be welcomed by regulars on this route.